WhatsApp desktop is a new program for Windows and Mac operating systems that enables users of the communication service to tune in from the desktop as well. Desktop users up until now had only options to use WhatsApp Web, a web-based version of the service, or rely on third-party services to use their WhatsApp account. WhatsApp desktop requires that you are using the service on a mobile device already. Additionally, the Windows version is only compatible with Windows 8 or higher, and the Mac version with Mac OS X 10.9 or higher. WhatsApp desktop displays a QR code when you start it for the first time which you need to scan with the app on your mobile device to authenticate and sync data. The latter means that you need to keep your phone connected to the Internet while using the desktop program as everything is handled using it. This is the same method that is used for WhatsAppWeb. The installer has a massive size of 61 Megabytes on Windows but the installation itself is straightforward. The scanning of the QR code may pose troubles though for some users as WhatsApp states on the screen that you should use the WhatsApp application on the mobile device to scan it but does not reveal how. What the company means by that is that you need to select WhatsApp Web under Settings in the application to do so. The desktop application displays the chat history on the left afterwards and on the right of that recent messages of the selected chat. It features a search to quickly find past messages or start a new chat from there. The chat interface supports the majority of features that the mobile app supports. You can type messages using the desktop PC's keyboard, add emoticons, attach files or use the voice message functionality if a microphone is connected to the computer. What WhatsApp desktop does not support currently is audio calls. The functionality is not implemented which means that you are limited to text chat and audio messages currently when using the desktop program. The desktop program offers some advantages over the mobile application. You can type using a full computer keyboard for instance, supports desktop notifications, and keyboard shortcuts that may improve your workflow when using the program. 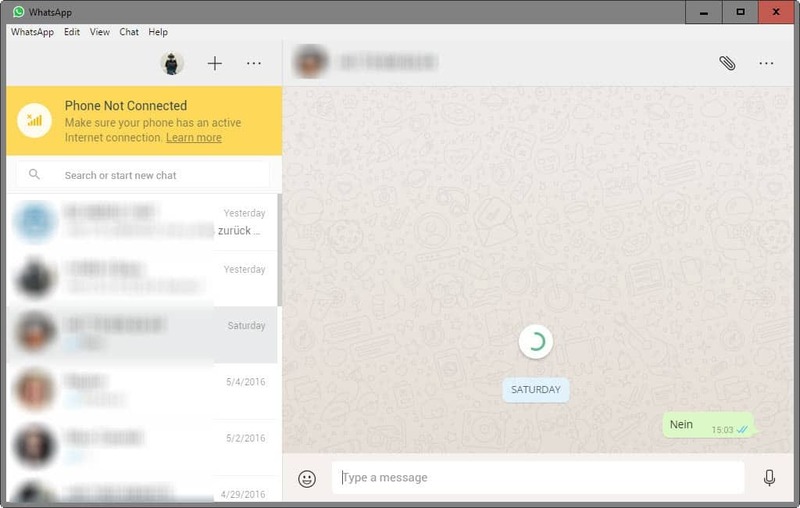 WhatsApp Desktop mirrors what is happening on the phone and relies on it to be connected to the Internet to work at all. On the good side, it may improve how you work with the communication service as typing with the keyboard is usually faster and more reliable than typing on a mobile device. It may come in handy at work or school, or in other situations where you have your phone nearby but either are not allowed to use it all the time or don't want to do so. All in all though, it is just another option to use WhatsApp. WhatsApp released a new desktop program for Windows and Mac operating systems that enables users of the communication service to tune in from the desktop as well. I haven’t check that yet because I’m getting some writing error while downloading file in Firefox (quite common nowadays) – so, is it a full, true application or just webkit/blink browser exclusively for one specific site? It is an application, but need WhatsApp running on a smartphone. The search in the desktop app is only for finding contacts, it isn’t for finding past messages yet. One thing the desktop app has over web version is you can select multiple messages to forward or delete. Good move for WhatsApp, overall, but the Win8 and up compatibility makes it a deal breaker for me. Facebook has conspired with Microsoft not to support Windows 7 platform ? It should be noted that Chrome official killed with the coming changes the launcher, so this was and is the only real consequences of it. I was hoping the mobile phone could be switched off with this version, but alas it still needs it to run. Very disappointing and useless to me. for a simple messenger, the size is too big also. WhatsApp Desktop works just fine on Windows 7 too. Just install it on Windows 8 and copy over the files from %localappdata%\WhatsApp\app-0.2.684. You may not get those awful, ugly and annoying toast notifications on Windows 7 that Windows 8/10 have but you still get an overlay on the taskbar indicating new messages which is subtle and distraction-free in fact. Is this what’s supposed to be in the main directory? The one where the .exe file is. If it is, then it works extracted with 7Zip :) I can’t test it as I have no use for this service and I don’t want it to create registry entries, but for those who want to use it on 7 (also I’m assuming the installer does not allow you to install it) I think this is an easier way to do it. So, can I use/register to whatsapp without a smartphone? No. You need WhatsApp on your phone and it needs to be connected when using the desktop version. I really don’t understand , why People don’t use Viber , Much better than this garbage. > The installer has a massive size of 61 Megabytes on Windows but the installation itself is straightforward. > Still needs the phone. Pretty much, 61 megabytes of bloatware? For me, sadly, it’s a useless app. It is bloatware. Telegram has a ‘real’ desktop client[one that does not force me to have a phone with active internet connection nearby; seriously, why does WhatsApp[Facebook] hates desktop so much] and they cut in at <20 MB. II started using whatsapp just for picture transfer when on mobile phone (to circumvent skypes annoying redirect to view incoming image on their website in browser – which is just hassle). The whatsapp is good at image transfer, however, it is limited by not having webcamming… if it did I’d drop skype completely. As my only real use is because of the mobile image, no real reason to go for this desktop app. Telegram is better than WhatsApp. Don’t forget that WhatsApp, like Instagram, is owned by Facebook, which you should avoid like the plague. Ditto. Anything from Facebook is crap. FB somehow will collect your data. Telegram is better in many ways. Why do all these apps require your mobile number? Where is the anonymity in that? In Telegram, phone numbers are private unless the users are each other’s contacts.